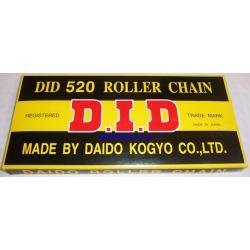 A Japanese made DID standard 520 (5/8 X 1/4) chain with 102 links. Available in a range of lengths, each listed individually. These are supplied with a split link. Additional split links and rivet links are also available.